2. Resulting from, expressing, or tending to arouse strong feelings. 3. Implies great vehemence and often violence and wasteful dispersal of emotion. 2. A soft drink made from carbonated water and flavored syrup. 1. 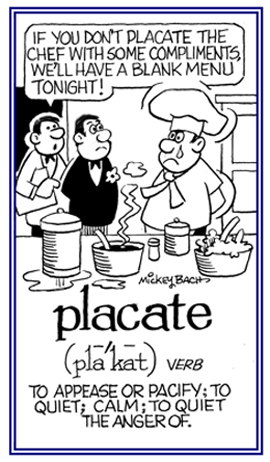 To make a person less angry, upset, or hostile; usually, by doing or saying something to please him or her: Because his wife was so dismayed at him coming home so late from work, Greg tried to placate her by promising to treat her to a nice restaurant tomorrow evening. 2. To calm down and to make less angry; especially, by appeasement; to conciliate; to pacify: The administrators placated the customers by agreeing to consider a reduction in prices for the items when they became available again. The clerk was placating the angry customer with an apology and a new replacement for the damaged item that was returned. 1. Someone who possesses great power; as a sovereign, a monarch, or a ruler: Some countries have potentates; such as, Russia and other places. 2. 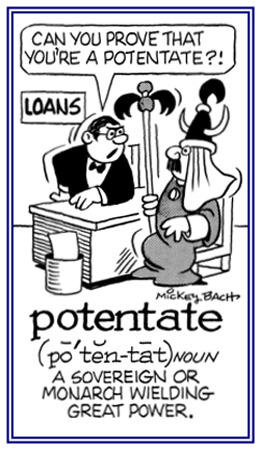 A person who dominates or leads a group or an endeavor: There are many industrial potentates who make significant decisions for their companies. 3. 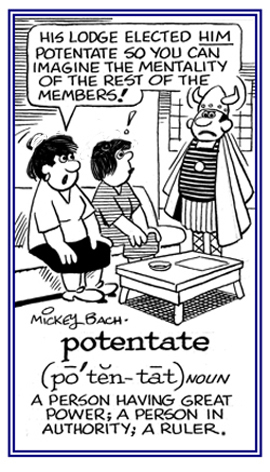 Etymology: from Latin potentatus, "rule, political power" from Latin potens, "powerful, strong." © ALL rights are reserved. 1. To be deliberately ambiguous or unclear in order to mislead or to withhold information: The local officials prevaricated about the real costs of the new city hall. 2. To avoid giving a direct and honest answer or opinion, or a clear and truthful account of a situation, especially by quibbling or being deliberately ambiguous or misleading: When anyone prevaricates, he or she is avoiding telling the truth or is not providing the real facts. 3. To stray from or to evade the truth; to equivocate: As a witness under oath, Bert didn't prevaricate but he answered all of the questions honestly. 4. 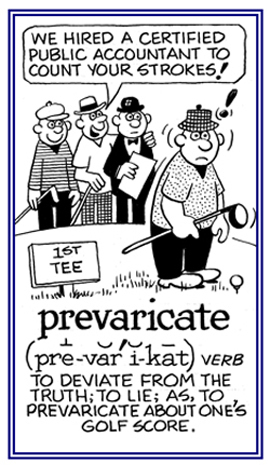 Etymology: from Latin prevaricate, "to walk crookedly" from varus, "knock-kneed"; from this the verb varicare, "straddle" was combined with the prefix prae-, "before, beyond" which produced praevaricari, "to walk crookedly" or "to deviate from straightforward behavior" and "to turn away from the truth". © ALL rights are reserved. 1. In religion, an archbishop or bishop ranking first among the bishops of a province or country: The church service to celebrate the completion of the new water works for the town was lead by the local primate who was assisted by several men and women from the community. 2. Any of various mammals which share common characteristics: Primates have the ability to use their hands for tasks, have oppositional thumbs, are able to climb, have eyes at the front of the face in order to judge distances, and include a tendency towards social behavior and interactions. There are terrestrial primates as well as arboreal ones. Some primates are active at night as well as by day. There are primates that are specialized insectivores as well as fruit-eaters and leaf-eaters. As a result, virtually all aspects of primates vary widely from species to species. 1. To produce saliva in the mouth, especially at an increased or excessive rate; such as, when food is seen, smelled, or expected. 2. To cause an animal in an experiment to produce large amounts of saliva. 3. 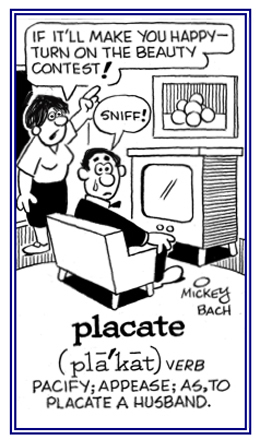 To feel or show an immense desire for or appreciation of something; an informal usage: "I'm practically salivating because of the sweet smell of the baking cake"; "He salivated at the idea of winning the lottery." 1. Descriptive of the avoidance of excitement or great activity and to be calm and relaxed: Jack and Jill walked on the beach with a sedate pace as they enjoyed the surrounding area. 2. Peaceful and quiet: Jeremy and his family are living in a more sedate neighborhood now compared to the noisier one they were in before when they were the city. 3. 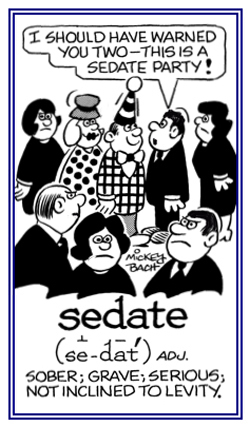 Etymology: from Latin sedatus, "composed, moderate, quiet, tranquil"; "to settle, to be calm" from sedere "to sit". © ALL rights are reserved. 1. In a bicameral form of government, the upper law-making chamber of government in many countries or states, past and present: Stuart's uncle was elected to the senate where he distinguished himself with his pro-environmental voting record. 2. Often the governing body or officials at a university: Mr. Fisk, the popular professor, was elected to the university senate. 3. Etymology: via Old French from Latin senatus, literally "assembly of elders", from senex "male elder"; source of English senile and senior. Showing page 5 out of 6 pages of 79 main-word entries or main-word-entry groups.